Recently I have begun to share "on this day" posts on my Facebook page. I have found that I really enjoy going back to revisit old posts. Sometimes I have forgotten that I posted something...or I am reminded of how much I love a particular dish... Seeing it first thing in the morning often inspires me to cook it for dinner that night. This morning I ran across a post from my first year. 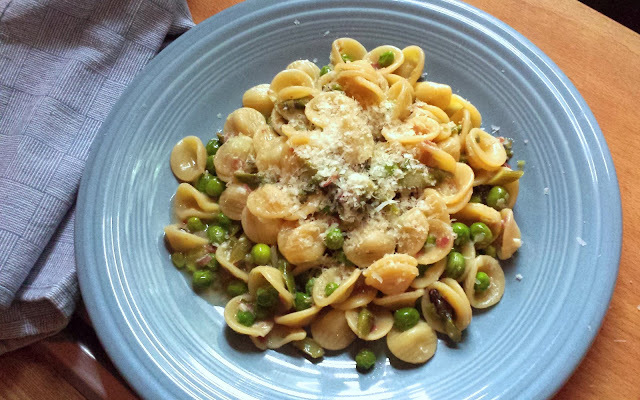 It was for a variation on a spring pasta that has been in my repertoire for years (and is one of our favorites): Orecchiette with Asparagus, Peas & Pancetta. In this particular post though, I didn't make it with peas. 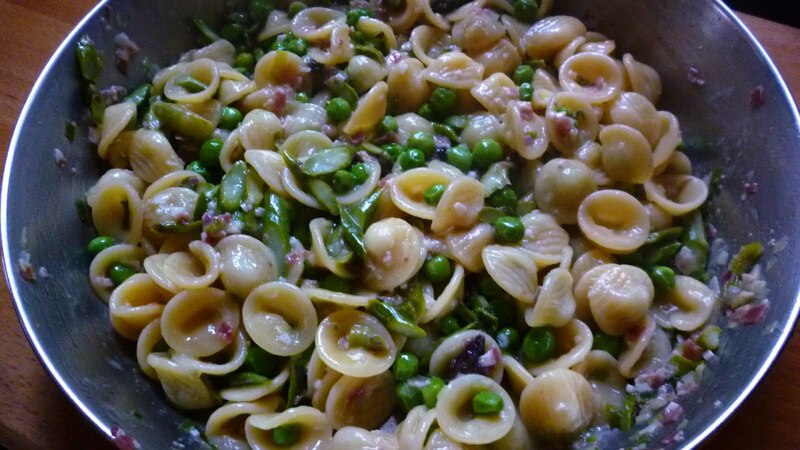 Instead, I made it with shell beans that I had frozen the previous summer. The pasta is delicious this way...and I'm glad I shared it...but as I looked at the post today, I thought it was a shame that I had never shared it the way I make it most of the time...with English peas. 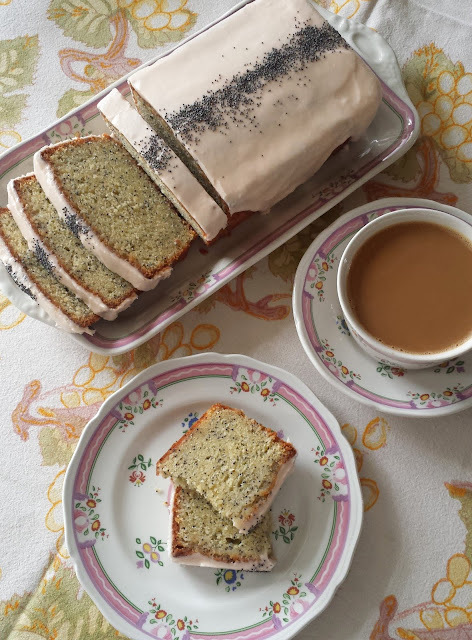 While I was looking at the recipe this morning, I realized that I had everything in the house that I needed to make it. Obviously it had to be dinner. And since it is quick to make, it was just the thing for the end of a long, busy week. 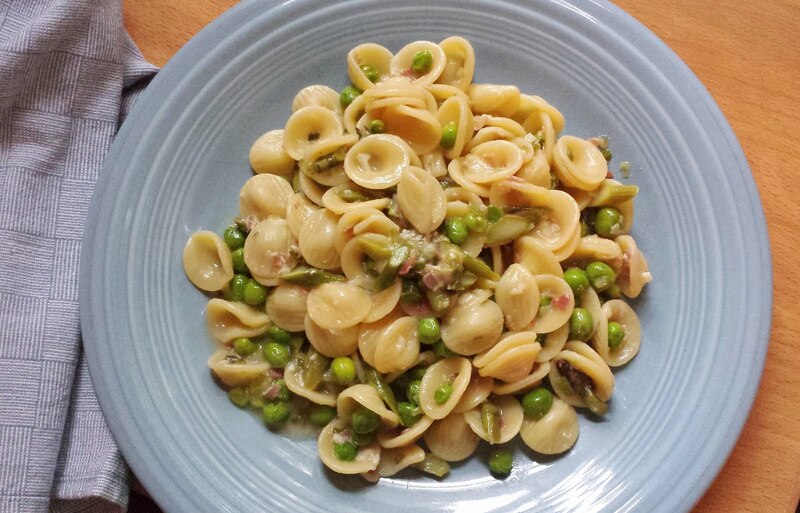 It also provided me with a perfect opportunity to share it in its original form (with peas)...and at the same time record the dish the way that I am making it now. Place the pancetta in a 12-inch sauté pan set over medium heat along with a tablespoon of olive oil. Stir and scrape to make sure it cooks evenly. When the pancetta has rendered its fat and is just beginning to crisp and sizzle actively, add the spring onions, parsley/thyme and garlic and continue to cook until the spring onions are softened and tender, about 3 minutes. Add more olive oil if the pancetta is very lean and the pan seems dry. 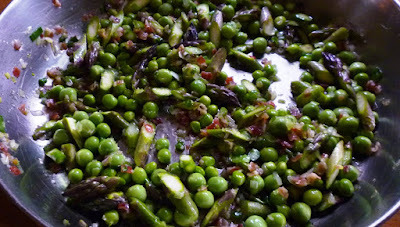 Add the asparagus and the peas, season lightly with salt and pepper and toss to coat with the seasonings. Add the broth and bring to a simmer. Cover and adjust the heat to maintain a gentle simmer. Check occasionally to make sure the pan is not dry, adding more water or stock, if necessary—the vegetables shouldn't be soupy—but neither should the pan be devoid of liquid. 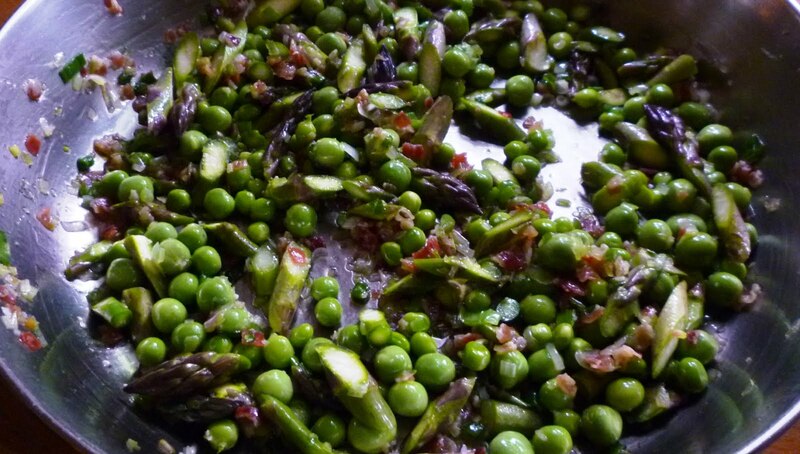 Continue to cook until the asparagus and peas are tender—about 6 to 10 minutes total. Taste and adjust the seasoning. While the sauce is cooking, bring 6 quarts of water to the boil in a large stock/pasta pot. Add 2 to 3 Tablespoons of salt. Add the pasta and cook until the pasta is al dente. Drain, reserving some of the pasta cooking liquid. Add the pasta to the sauce, along with the butter. 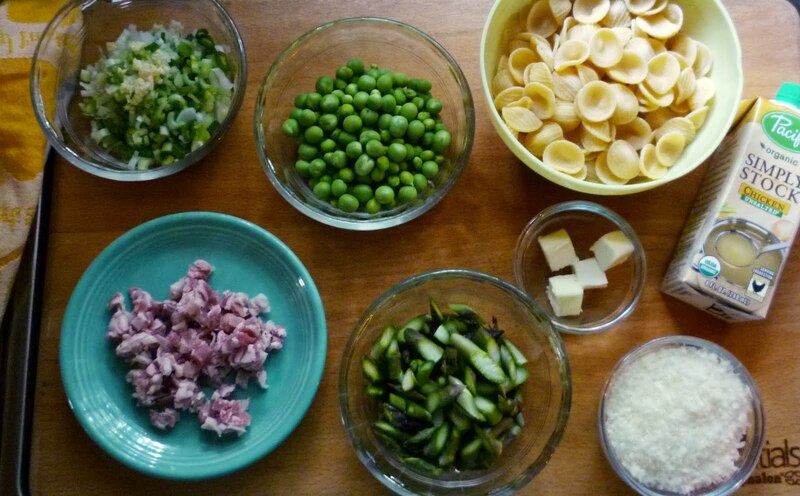 Stir or toss until the pasta is coated with the sauce and the butter has emulsified into the sauce. If the pasta seems dry, add some of the pasta water. Serve topped with grated cheese, if desired. Serves 4 to 6.